CONGRATULATIONS TO SEAN DOWLING, NJ ATHLETIC DIRECTOR OF THE YEAR. The Northwest Jersey Athletic Conference prides itself on being one of New Jersey's premier high school conferences and is comprised of 39 high schools located in Northwest New Jersey. 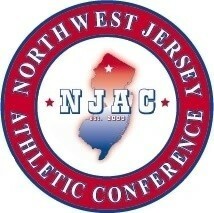 The NJAC fields a full complement of NJSIAA (www.njsiaa.org) sponsored boys and girls interscholastic sports. To the right, under "Calendars", you will find all of the NJAC School's who are using RSchoolToday for their athletic schedules. You can click on any of the schools to link to that school's athletic and activity calendar. The calendar will allow you to view all athletic team schedules and events scheduled for that school for any date. A great feature is the "Notify Me" option located in the upper right of the calendar home page, which automatically emails and/or text messages you reminders, cancellation notices, reschedule notices, and updates for the current events. Be sure to sign up. Below the Calendar you will find the "rSchool Parent Guide." This is a fantastic document that takes you through the nuances of this strong scheduling program. It will show you how to utilize it's strengths to the fullest. Below the Parent Guide is a link to each school's official website. You can click on any school. If the school is not using the rSchool Calendar, you will be able to find links to their schedules through these school sites. We hope that you will find this website to be a very useful tool to keep informed with what's happening conference-wide or at the specific school you are interested in.